Nook & Pantry is a food blog I follow and admire since the early days. Over the past few years, I have watched the blog blossoms with mouthwatering recipes and seriously exceptional food photography. Authored by Amy, Nook & Pantry is a journal of Amy’s cooking. I love the recipes on Nook & Pantry—simple, delicious, and down-to-earth everyday dish. Please welcome Amy as she shares her family’s drunken chicken recipe, a Shanghainese dish that I truly enjoy. When Bee asked me to write a guest post for Rasa Malaysia, I immediately said yes. Rasa Malaysia is one of my favorite food blogs and writing a guest post is a tremendous honor. Agreeing was a no-brainer—choosing a recipe, on the other hand, was the hard part. I was torn between a recipe that showcases the wonderful seafood we have here in the Pacific Northwest or something that pays tribute to my Chinese heritage. While we both love seafood, but in the end, because of Bee’s focus on Asian cuisine, I settled on the latter. My family is from Shanghai and drunken chicken is a well-known specialty of the region. Summer is coming to an end but for areas of the country still experiencing lingering heat, this cool and refreshing recipe could be just what you’re looking for. When I visited my relatives in Shanghai many years back, I remember my uncle made the best drunken chicken. He pulled out an unassuming looking Tupperware from the fridge, but inside sat bite-sized pieces of chicken with a shiny, bouncy skin, surrounded by wine spiked aspic. Drunken chicken is traditionally made with a whole chicken but no matter how delicately I cook the chicken, the breast meat is never as tasty as the dark meat. The first time I made this, I used a whole chicken, but the second time I used just the leg quarters and was much happier with the results. There are two techniques you can use to cook the chicken. The more traditional way is to poach a whole chicken gently in a pot of barely simmering water. The plus side is that huge pot of water transforms into the most delicious chicken broth that’s great for soups. Or you can steam the chicken. Dark meat is way more forgiving of the higher heat in the steamer. No one likes dried out, cardboard chicken breast no matter how much booze you soak that sucker in. After steaming, the chicken legs release about a cup of gelatin packed chicken stock concentrate and after it’s mixed with shao hsing rice wine, it solidifies into a delicate aspic. The jello, gelatin, aspic, whatever you want to call it, is the best part! It’s nothing like the strangely colored, rubbery concoction ubiquitous to American cafeterias. This chicken and wine flavored aspic hugs each piece of chicken and melts instantly in your mouth, serving as a built in self-basting system for the chicken. But if jello isn’t for you and regardless of which method you choose to cook the chicken, drunken chicken is best served cold. You can serve it alone as an appetizer or with a bowl of noodles in hot chicken broth or fluffy white rice for a juxtaposition of temperatures. There’s one catch—the Chinese cleaver. After cooking, it’s traditional to use the Chinese cleaver to chop the chicken into bite-size pieces that can be easily picked up with chopsticks. One decisive twack is designed to cut through skin, meat, and bone. Don’t try to do the same with a chef’s knife, it will never forgive you. A Chinese cleaver is heavy duty because the weight of the knife does most of the work. The trick is to aim well and make one strong decisive movement. Even a split second of hesitation will translates a botched cut job where the cleaver doesn’t make it all the way through the bone, or bone shards. If you don’t own a Chinese cleaver or don’t want to deal with butchering chicken, that’s okay! You can cook drumsticks, which are smaller, score larger pieces of meat down to the bone before marinating so the wine has a chance to penetrate. 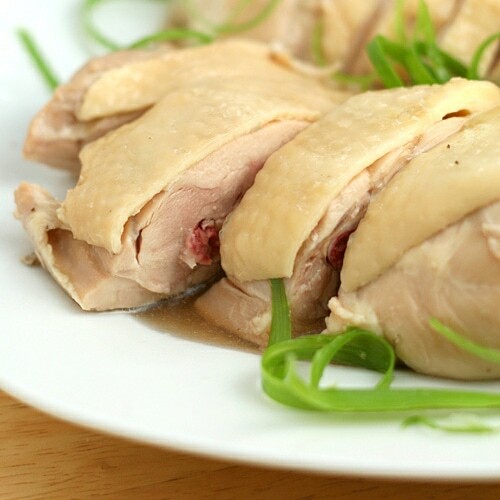 Drunken chicken is a Shanghainese cold dish where chicken is steeped in rice wine, hence 'drunken chicken.' This drunken chicken recipe is by Nook & Pantry. Mix the salt with the two peppers. Rub the chicken all over with the salt and pepper and let it sit for an hour. Bring 6 cups of water to a boil in a Dutch oven or large pot, add the green onion bottoms and ginger. Add the chicken, make sure there is enough water to cover the chicken, and return to a boil. Lower the heat to a bare simmer and simmer for 10 minutes. If you’re using a whole chicken, when the water is simmering for 10 minutes, lift the chicken out of the water and make sure the stock in the cavity empties back into the pot. Do that 3 times for a whole chicken. For chicken pieces or leg quarters, gently stir the pot once or redistribute the leg quarters so they cook evenly. After 10 minutes, cover, turn off the heat, and allow the chicken to poach undisturbed until the water cools almost to room temperature. Bring water to a boil in the steamer. Place the chicken in an even layer, scatter the green onion and ginger all over and steam over medium heat for 30 – 40 minutes or until the internal temperature near the bone reaches 165 – 170 degrees F. If the chicken pieces are larger, they will take longer to steam. If any of the pieces are touching make sure to redistribute them in the middle of cooking so they cook evenly. Mix the ice cubes and water and shock the chicken in ice cold water for 2 minutes. If you poached the chicken, shock it after the chicken has cooled to room temperature. If you steamed the chicken, shock it immediately after steaming. After cooking, cut the chicken into bite sized pieces, or score the chicken meat with a knife. Put the chicken pieces into a large container. Mix 3/4 cup to 1 cup of the chicken stock (the liquid you poached the chicken in or the liquid that comes out of the chicken after steaming) with the sugar and rice wine. Taste the marinade and add salt if needed. Pour it over the chicken pieces and let this sit in the fridge at least overnight before serving. Serve cold. Oooh I love this dish. I don’t know why, it might not have an appealing aesthetic but there’s something so delicious about the chicken and the gelatin around it. what a treat?! Woooo I will like to give this a try! Looks very moist and succulent. It’s such a great way to cook chicken. I remember reading about this dish in The Last Chinese Chef. It looks great! I love drunken chicken the first time I tasted it. Looks really succulent & delicious. Great recipe & background information! This is quite easy and simple, think i am cooking this next week. Thanks for sharing! thanks alot, i’ve been finding this method of how to steam a chicken. thank you! I am a bit confused. You have Shaoxing rice wine in your recipe, but I don’t see it is used in the cooking process!? Yes, it is stated in the cooking process as rice wine. Shaoxing wine = rice wine. :) Tip to poached chicken (breast especially) is to let it sit in low heat around 65 degree Celsius. I find if I bring the stock to a boil again, the chicken tend to be tough. For the best result, the chicken should be at room temperature before going in to the boiled water. And the most important thing of all is to be patient. Can you have this dish hot with out reheating to avoid drying it out? Is there another substitue for rice wine? Dry sherry or cooking sake. Can’t believe I first made this some 30 years ago. I bought the ingredients from a fantastic – I really mean fantastic (you could spend an afternoon there, and not get bored) – Chinese wholesale shop in Birmingham, England. Even bought an expensevive-ish (£10?) chinese meat chopper to cut the chicken. You substituted the rice wine with sherry and you was at a Chinese wholesale shop? You should try it next time with the Shaoxing rice wine….. Unbelievable!! this is crazy delicious. i cooked this twice over the period of 2 weeks. and my husband is still crazy over it, and he’s been raving about it so much, his friends want to try it too. i always have to cook extra for him to get his 2nd helping. thank u so much for posting this. really helps singaporeans living overseas get over their cravings for sg hawker food. hehe. i posted this recipe on my blog, and added a link to u..
you have shaoxing wine and sugar in your recipe but i didn’t see you use it. when should i use it if i choose steam method? Whenever I steam or boil whole chicken, the skin always tears when I try to handle the whole chicken. Any tips on keeping the skin flawless? The trick is to simmer the chicken after the second boil. Keep the flame low so the bubbles rise up to the surfact slowly, almost one at a time. Secondly, be patient. Third, shock the chicken in ice water after it is cooked. oh woww.. my MIL made this for me last week and can’t wait to try this on my own! Any ideas on what the leftover poaching liquid can be used for? As soup to sip besides a dipping sauce for your main dish. You can add melon or vegetable you like to garnish it. Does the type of chicken make any difference? Chicken fresh and frozen? Hi would it taste as good If I buy chicken that is already chop up? Yes you can use that. Using the poaching method, with a whole chicken, how long is the cooking time? It seems to be 10 minutes plus time to cool… is that right? Hi, can I subtitute shaoxing wine with ang ciu? Ang ciu has sweet taste. Thanks. I don’t know what is ang ciu so I am not sure.